Aggressive sales promotions by large and small companies and the introduction of functional soaps have had a tremendous impact on the demand for soaps and soap noodles over the past few years. Considering the immense competition among players in a highly fragmented market, companies have been compelled to offering products with a wide range of features such as aromatherapy, moisturizing, anti-bacterial, medicated, and herbal soaps. As the demand for these products surges across the globe, the demand for soap noodles has also grown. The revenue of the global soap noodles market stood at US$2.5 bn in 2015 and is forecast to reach US$3.2 bn by 2024, expanding at a modest CAGR of 2.7% from 2016 and 2024. The demand in terms of volume for soap noodles is projected to rise at a 2.1% CAGR during the same period. Soap noodles are categorized into various types depending on the raw materials used such as vegetable oil and tallow. In 2015, vegetable oil-based soap noodles led the overall soap noodles market vis-à-vis tallow-based soap noodles. Different specifications of soap noodles are produced by adding various functional additives depending on their end-use application such as toilet soaps, laundry soaps, translucent soaps, high lather soaps, and medicated soaps. The abundant supply of palm oil and the rise in consumer preference regarding the usage of vegetable-based materials are the major factors estimated to drive the vegetable oil segment during the forecast period. Tallow-based soap noodles also offer lucrative opportunities for players considering that tallow is presently the best alternative material for palm oil in the production of soap noodles. The global soap noodles market comprises five main regions: North America, Latin America, Europe, Asia Pacific, and the Middle East and Africa. 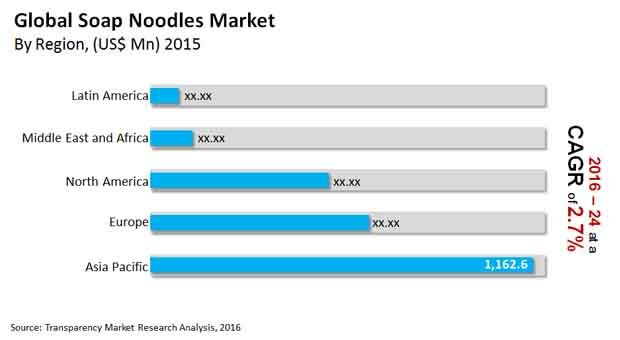 Asia Pacific emerged as the leading contributor in the global soap noodles market in 2015, followed by Europe and North America. Increasing awareness about hygiene among the population and an improvement in the standard of living in the developing economies of Asia Pacific such as China, India, and Japan are projected to boost the demand for soap bars. This, in turn, is estimated to propel the demand for soap noodles in APAC in the near future. Asia Pacific is also projected to be the fastest growing market over the course of the forecast period with end-user industries such as healthcare and personal care on the path of rapid expansion. China is one of the major consumers and suppliers of soap noodles. The majority of soap noodle manufacturers are based in Malaysia and Indonesia due to the easy availability of raw materials in these countries. Europe is also a key market for soap noodles owing to the increasing production of soap bars with special functional additives. Permata Hijau Group, KLK OLEO, 3F INDUSTRIES LTD., Deeno Group, Adimulia Sarimas Indonesia, IOI Oleochemicals, Wilmar International Ltd., John Drury, Musim Mas Holdings, and VVF Limited are some of the prominent names in the soap noodles market. Soap noodles are base soaps used in the manufacture of soap bars. They are produced from the reaction between fatty acid and sodium hydroxide. Soap noodles, added with pigments, fragrance and other components are used to produce different types of soap. Vegetable oils such as coconut oil or olive oil, palm oil, and animal fats (tallow) are major raw materials required for the manufacturing of soap noodles. These raw materials are ‘saponified’ using sodium hydroxide to form salts of fatty acids. The report provides in-depth analysis and forecast of the soap noodles market on the global as well as regional level. The report includes forecast for the period from 2016 to 2024 in terms of volume (kilo tons) and revenue (US$ Mn). Quantitative data has been derived through extensive secondary research of the global soap noodles market. Secondary sources typically include company websites, relevant magazines, government documents, and press releases. The top-down approach has been adopted to derive the regional numbers from global revenue and volume figures. Furthermore, the bottom-up approach has been employed to derive data for various source segments based on demand for soap noodles in each geographic segment. A combination of top-down and bottom-up approaches helps in validation of the quantitative data of the market. The data was further validated with the help of primary research with industry experts to ensure accuracy of derived numbers. Detailed analysis of various factors driving the global soap noodles market has been included for astute decision making. Impact of these drivers during the forecast period has been included with data to substantiate research findings. Furthermore, factors restraining market growth have been included for better understanding of the market. Impact of these restraints has been analyzed over the forecast period. The report also comprises various opportunities available for market growth over the next eight years. Opportunities entail untapped or recently explored factors that are anticipated to drive the soap noodles market during the forecast period. The report includes value chain analysis to help understand the industry thoroughly. Value chain analysis comprises detailed evaluation of the roles of various entities involved in the soap noodles industry, from raw material suppliers to end-users. Various processes employed in the manufacture of soap noodles have been included in the value chain analysis. Porter’s Five Forces model has been employed to determine the degree of competition in the market during the forecast period. Company market share analysis has been included for better understanding of the competitive landscape. Company market share analysis includes the market share of dominant players in 2015, based on their production capacities and other factors. Furthermore, market attractiveness analysis has been conducted to analyze source segments that are expected to be lucrative during the forecast period. This is based on various factors such as market size, growth rate, profitability, raw material procurement, and competition in each source segment. Based on source type, the soap noodles market has been segmented into vegetable oil and tallow. The report comprises detailed analysis of all the segments in the regional and global markets and forecast based on current and future trends in the industry in terms of volume (kilo tons) and revenue (US$ Mn). In terms of region, the market has been segmented into North America, Europe, Asia Pacific, Latin America, and Middle East & Africa. Demand for soap noodles in each of its source segment has been analyzed and forecast for a period of eight years. The report also comprises profiles of leading companies in the soap noodles market. These include Deeno Group, IOI Oleochemicals, Wilmar International Ltd, and VVF Limited. Various attributes of these companies such as company overview, business strategies, and recent developments form the core of the company profiles section.